Most English versions of the bible do a pretty good job of trying to give a literal translation of what has been written in the original Greek text. However, at times, the translators personal opinions have entered into their decision on how to translate a word. An example of this is how the KJ translators, have translated the word “Passover”, in Acts 12, verse 4. Instead of translating it “Passover”, they have changed the word to “Easter”. The obvious reason for this incorrect translation is that those particular KJ translators had already come to believe in celebrating what men call “Easter”, even though the bible never authorizes anything like that. But because those KJ translators believed in a so called “Christian” celebration of the resurrection of Jesus, that men call “Easter”, they took the liberty of changing the word in the scriptures to suit their belief. That’s certainly never a good practice, to change the words of God! But let me clarify something here. When I said they “changed” the word, I don’t mean that they changed the meaning of any word. You can’t just change the meaning of a word at your whim, it doesn’t work that way. When I said they “changed” the word, I mean they actually removed one word, and they inserted a different word. They changed the words in the text! That’s not a good thing! What did I read somewhere, about leaving words out of the bible, and adding words to the bible? Oh, I know, it was in the bible. The bible says, in Deuteronomy 4, verse 2; “You shall not add to the word which I am commanding you, nor take away from it, that you may keep, the commandments of the Lord, which I commanded you.” Of course the bible says something almost exactly the same in Revelation 22:19. I wonder if that applies to scribes and translators? Think about what it means to “keep the commandments of the Lord”. It means the same thing in the old testament as it does in the new testament. Most of us think of “keeping” the commandments, as obeying the commandments. And that’s definitely a part of what it means. But it’s really by implication, that it means to obey the commandments. But what it literally means, is to “guard and preserve” the commandments of the Lord! We are commanded to “keep the commandments”, by guarding and preserving” those commandments. When you preserve something, do you change it? No, you “preserve it” in exactly the same condition in which you received it. Therefore, to “keep” the commandments of the Lord, is to guard them from being changed! Keep guard over them, and preserve their purity! And then of course by implication, obey what they teach. 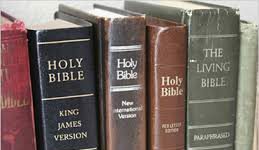 Now, while it’s true that in good reliable versions of the bible, it is seldom, where a word is actually changed. But unfortunately, it’s quite common, in what is called, a “paraphrased” version of the bible. In other words, the “translators” of those versions, are giving us their own words, of what they believe the bible is saying, rather than giving us the literal words, given to the inspired writers, by God. One such “paraphrased” version, is called “God’s Word Translation”, and another is the “New Living Translation”. Now, in any translation which does not attempt to be literal, you are definitely getting a man’s “theological opinion” of what he thinks the bible says, instead of getting the actual words of God. But don’t you want to know what God says, and not what man says? So then a “paraphrased” version of the bible, is really quite unreliable to say the least, and it’s quite deadly to your soul, at it’s worst. I often think about the words of 2 Peter 1, verse 20, which says; “Know this first; That not any revelation of scripture, is of one’s own release.” Most versions say something like this; “..No prophecy of scripture, is of any private interpretation..” But a “prophecy” is simply a revealing of God’s word. So then; “..No revelation of scripture, is of any private release”. I’m shying away from the word “interpretation”, because that word has led a lot of people to think that the verse is talking about the people who hear the revelation, and how they interpret what it means. But this verse is talking about the people who are giving the prophecy, not the ones hearing it. The one who is giving the revelation of scripture, is “releasing” God’s word to the world. And that’s exactly what the original word means. It means to “unpack” or to “release”. In other words, the people who God inspired to release His words, weren’t releasing their own words, they weren’t giving us their own “private interpretation” of what God wanted them to say. They were giving us GOD’S own words, not their own. The next verse really says it all. Verse 21 says; “For no prophecy was ever made by an act of human will, but men moved by the Holy Spirit, spoke from God!” Men were “moved” by the Holy Spirit; Men were “inspired” by God Himself! That’s why 2 Timothy 3:15 says; “All scripture is God-breathed..” Because none of it ever came from the mind of man, but from the mind of God! You probably heard this too, but I’ve got a friend who said to me one time; “The bible is open to interpretation”. Now that’s one of the most ridiculous things I’ve ever heard. Someone who says that, is trying to tell you that the God of heaven, has given us a book, that has no definite meaning at all, and that everyone who ever lives can simply attach any meaning to it that they choose? “Open to interpretation! That’s absolutely absurd! If the men who spoke, and wrote our scriptures, weren’t allowed to “release” their own words, then certainly we who hear those words, aren’t allowed to “interject” our own interpretation. But again, this verse isn’t talking about how people who hear the prophecy, interpret what is said. This verse is talking about the fact, that the person who is revealing God’s word, has never been at liberty to reveal their own interpretation of what God wants us to know. The persons who were “releasing” the words of scripture, were not “releasing” their own words, but they were “releasing” and “revealing” God’s words. Now, let’s get back to the various English translations of the bible, and think about what it means to “paraphrase” a verse, instead of giving a literal translation. To “paraphrase” means that you are changing, the original words of scripture, and giving words that you think, express what God wanted to express. Instead of giving a word-for-word translation, you’re giving your opinion of what you think the original words meant. In other words, you’re doing exactly what the writers of the bible, were forbidden to do! You’re releasing your own private interpretation! “NO prophecy was ever made by an act of human will..” But a “paraphrasing” of the bible, is without a doubt, an act of human will. I personally spend a lot of time, giving you the exact meaning of words. But I don’t ever give you my opinion, of what I think a word should mean, according to my own theology. I give you the exact meanings of the words, exactly as they were used in the scripture, and then I base my theology, on those meanings. And that’s what I ask you to do as well. Listen to the exact words of God, and understand exactly what they mean, and then base your theology, on exactly what the bible says. To me, this is kind of a “no-brainer”, but many people don’t see it this way. A lot of people don’t see the need to understand every word exactly. What’s the most obvious difference that you hear, between those two readings? The obvious difference, is that the NLT has added two words, that are not in the original text. The words, “requirements”, and “freedom” have been added to the verse. And it really changes the meaning of the verse, and it leads to a completely false teaching as well. And here’s why that creates a false teaching, and why it’s so dangerous.. The original wording of the verse is contrasting the law of Moses, with the grace of God. There was no forgiveness of sin under the law of Moses, and that’s why sin was the “master” over people during that period of time. A lot of people question the fact that there was no actual forgiveness under the law of Moses, but it’s made quite clear in Hebrews 10, verse 4; “For it is impossible for the blood of bulls and goats to take away sins!” And if it’s impossible for those sacrifices to take away sins, then there was no forgiveness of sins! Verse 3 says; “But in those sacrifices, there is a reminder of sins, year by year.” The sins never went away, there was no actual forgiveness for them, under that law. The law of Moses was not capable of removing sins! Those sins are now “satisfied”, there’s no “reminder” of them ever again, like there was under the old law. They’re gone! And when the bible says; “For the sins of the world”, that means the sins of everyone who HAS ever lived in the world, and everyone who WILL ever live in the world. So then the sins committed under the old law, are forgiven under the new law. Hebrews 9, verse 15 tells us; “..He is the mediator of a new covenant, in order the since a death has taken place, for the redemption of the transgressions that were under the first covenant, those who have been called, may receive the promise of the eternal I heritance.” Not every sin that was ever committed, is forgiven, but the sins that were repented of, just like the sins of people today. Repentance has always been mandatory. So then the contrast, and the teaching of Romans 6, verse 14, is that sin was your master under the old law, because the old law was not capable of forgiving sin. But sin is no longer your master under the new law of Christ, because your sins are forgiven by Christ, who IS the “grace of God”. But now look what happens when you add the word “requirements”, and the word “freedom”. Now you’re no longer contrasting the law of Moses, with the law of Christ, which is spoken of as being “grace”. Now you’re contrasting adhering to requirements, with having freedom from requirements. And that is not biblical! The NLT specifically says; “Sin is no longer your master, for, (or because) you no longer live under the REQQUIREMENTS of the law, but you live under the FREEDOM of God’s grace.” Now what that is saying, is that the “requirements” were the reason that sin was master over us, and that “freedom” from requirements, is what makes us free from sin. That is anti-scriptural, and that is a deadly false teaching! ALL laws come with requirements. The law of Christ, has requirements, just like the law of Moses had requirements. Even though they are different requirements. All laws have requirements. Sin was not the master over anyone because the old law had requirements. On the contrary; Sin was master over everyone, because the old law wasn’t able to take away sins! And no one is free from the “mastery” of sin, because of freedom from requirements, because there is no freedom from requirements! The law of Christ has requirements! We are no longer slaves to sin, because the law of Christ, has the power to take away sins. That’s about as simple as it gets! What the law of Moses couldn’t do, the law of Christ, can do. If you go through life thinking that there are no requirements to the law of Christ, which was brought to us by the grace of God, then obviously you will not follow those requirements which are contained the law of Christ. And what will be the result of not following the requirements of the gospel? You will be lost eternally! All because someone “added” a couple of words, thereby “changing” the meaning of a verse of scripture.